Temperatures may reach 80 today; rain in forecast for Thursday – Welcome to Wyandotte Daily! Wednesday will see a beautiful, windy, mostly sunny day with a high near 80 degrees, but look for that to change on Thursday. Today, a south wind of 13 to 18 mph will increase to 19 to 24 mph in the afternoon, and winds could gust as high as 34 mph, the National Weather Service said. 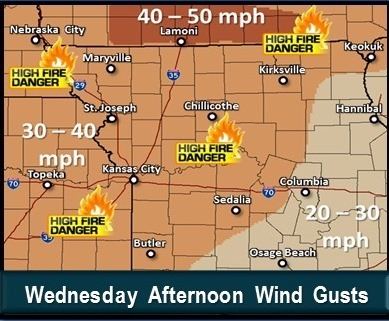 The windy and dry conditions this afternoon means there is an increased chance of fire danger, the weather service said. 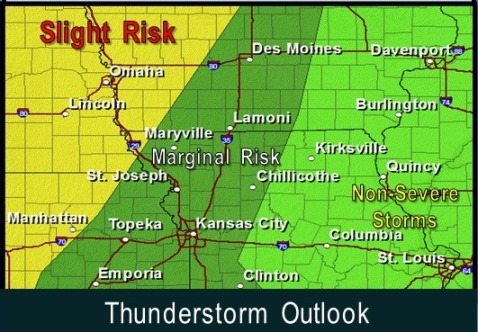 A cold front that will visit Nebraska and Iowa this afternoon, causing thunderstorms, will then move into this region tonight, bringing a small risk for hail and strong winds, according to the weather service. There could be some locally heavy rainfall late tonight and early Thursday morning. After 1 a.m., there is a 90 percent chance of precipitation, with showers and thunderstorms likely, the weather service said. The low Wednesday night will be around 60. Thursday, there is an 80 percent chance of rain, the weather service said. A north northeast wind will be 8 to 13 mph. The high will be near 68. 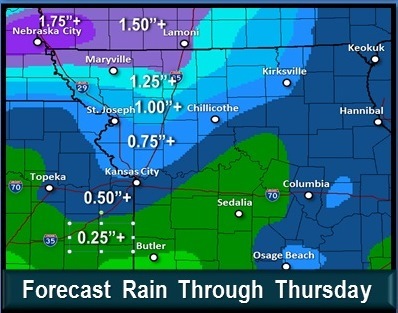 There could be between a tenth and quarter of an inch of rain, the weather service said. Thursday night, there will be a 40 percent chance of showers. The low will be around 44. Friday, there will be a 30 percent chance of showers before 1 p.m., the weather service said. Skies will be partly sunny with a high near 54. The north wind will be 16 to 20 mph, with gusts as high as 28 mph. Friday night, the low will be around 33. Saturday, skies will be sunny with a high near 64, the weather service said. Saturday night’s low will be around 44, according to the weather service. Sunday, the high will be near 67, and Sunday night, the low around 49, the weather service said. On Monday, there will be a 30 percent chance of showers and thunderstorms, with a high near 70, according to the weather service. Monday night, the low will be around 56. Tuesday’s high will be near 71, the weather service said.